The brand new MAKO Freedive Gear Bag has been redesigned from the ground up! First, we dramatically increased the strength and thickness of our waterproof material, webbing and stitching. We also increased the strength of the zippers and zipper pulls. Compartment 1: Left side compartment can hold a pair of freedive blades. 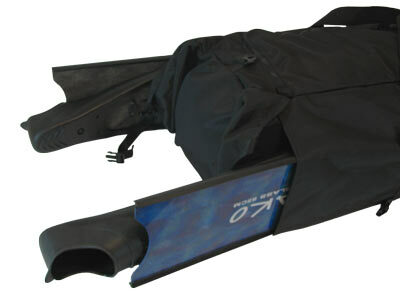 Or, you can store your floatline and un-inflated float in this elongated side pocket. Compartment 2: Right side compartment (just like left side compartment) for another pair of fins and, or accessories. Compartment 3: Main compartment for storing wetsuits, floats, floatlines and all other dive gear. Compartment 4: Smaller side compartment is perfect for your Go Pro cameras and/or personal effects such as wallet, keys, license, etc. The Freedive Gear Bag is waterproof and measures 41 inches long x 17 inches wide x 12 inches tall. Helpful Hint: If traveling on an airline, or in remote areas, we recommend using both MAKO gear bags (MAKO Freedive Gear Bag and the MAKO Ballistic Mesh Dive Bag). 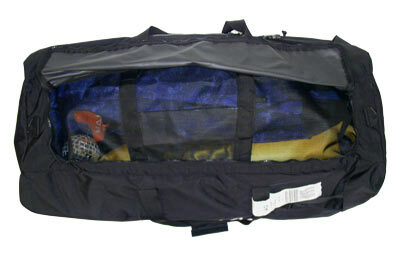 As shown in the photo to the right, the gear is stored in the Ballistic Mesh Dive Bag which is placed zipper size down inside the Freedive Gear Bag. Notice the wetsuit and float is facing up with the smaller and the “easier to grab” items are hidden from view. Also note that to access the gear, the inside Ballistic Mesh Gear Bag must be pulled out in order to access the zipper, thus further reducing the possibility of theft. Sure, the mesh could be cut with a knife, but that would bring attention to the theft and it is much less likely. Another advantage of the two bag system is that the Freedive Gear Bag can used to store personal items as well and be left in the hotel room, while the lighter, mesh bag can be used specifically for the boat or beach dives. Our Ballistic Mesh Dive Bag fits nicely inside the Freedive Gear Bag when traveling so contents can't be seen. Fits all the gear needed for two spearfishing travelers. I suggest also getting the Ballistic Mesh Bag for Checked baggage to prevent any easy theft. Great bag so far. Has plenty of room for fins and multiple wetsuits. Seems very well built and durable. Looks like a great bag! Super durable, great pockets. I already have the mesh bag, which fits inside. I will be taking them as my primary gear bags to New Zealand to compete in the World Freshwater Spearfishing Championships in March. Go Team USA! Just love love my new wet suit. I love you can call the shop and get ahold of a real person and they always had time to talk to me about sizes and all. I’m off to Bahamas now to try my new fins and spear some dinner! I’ll write a review on the fins when I get back.